Bolt Cloud introduces a new feature, where the user will get the sample code for plotting the graph on the click of a button. Go to the product configuration page. Click on Import Example Code icon. Select the code from the drop-down and click on Import. Hi, how I can read a value at particular time interval ? Example at 2pm I see that my analog value is 1002 how I can read this value in a variable and make the decision accordingly? @sahanibrajesh89 Currently, the Bolt Cloud does not have a functionality for that. 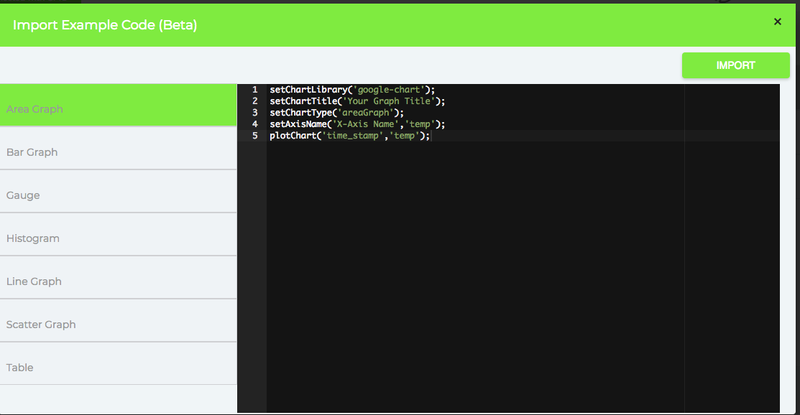 You can access all the data for a device by calling the fetchData method via the API. Once you have got all the data, you can then iterate over it to find the data in between a particular time interval. However, this is not a free API and requires upgrading to a higher plan. For now, you can access the data for a particular time by making the call at that particular time.